Today I am feeling a far greater certainty that our government is going to see through this war to its necessary end. That our prime minister is working with resolve, looking first at the people of our nation and not over his shoulder at Obama, or the UN. 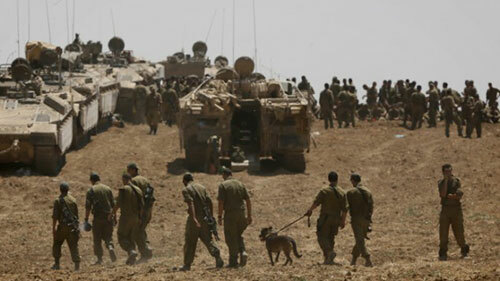 Another 16,000 reservists have been called up and more troops were deployed in Gaza today. We are stepping up the pace of the fighting, and expanding the arena of battle, at the same time that we are seeking and destroying tunnels. We have sent a delegation to Egypt, where a ceasefire is being discussed. But Netanyahu says ceasefire or no ceasefire, we will not stop our work. He will not accept any ceasefire proposal that does not allow us to complete our work on the tunnels. But my checking – and I have two very solid sources here, one with PA connections and Arabic-speaking – indicates that this is real, or may yet be, and that Netanyahu promised nothing in terms of a negotiating position, or what we would give to Abbas with regard to “two states” or his position in Judea and Samaria. What may be the case is that the international community would hope to see Abbas involved in a demilitarized Gaza at some level – at a bare minimum, regarding supervision of crossings. But this isn’t about the community’s desire to enhance Abbas’s position.This is about fear and hatred of Hamas, and thus an eagerness to see it taken out. One of my sources spoke specifically about growing fear of radical jihadists in Europe, which has motivated the EU to completely support Israel’s bid to undo Hamas. “One-hundred percent,” he said. And then this same source said, without blinking an eye, “But not the United States. Obama is for the Muslim Brotherhood.” It was his speculation that Netanyahu mentioned the US too so as to present a solid front, but that in the end the US, because of its position, would be frozen out. Netanyahu also spoke about “other important elements in the international community who have accepted our position.” Why wouldn’t he name these elements? Because they are elements who prefer not to be publicly allied with Israel, even as they support Israel’s position against Hamas. The first of those elements would, quite clearly, be Egypt: Egypt’s president, al-Sisi, despises the Brotherhood. Khaled Abu Toameh has just written an article about the alarm expressed in certain Arab quarters with the current pro-Brotherhood position being taken by the US, which ultimately might even bring Iran into the picture. “According to a senior Abbas advisor, the Palestinian Authority president urged the Saudi monarch to exert pressure on the Obama Administration to keep Qatar and Turkey out of the picture. And so, my friends, we have to sit tight and see how this plays out now. I do not say it metaphorically, but rather in very real terms: Please pray. The PR war may have taken a turn for the better as well, because the lethal antics of Hamas and its partner-in-terrorism, UNRWA, are being exposed at a new level. What I wish to focus on here is one specific incident, with more to follow soon. I ask that you note it and share it absolutely as broadly as possible. Please!. You know the routine: Tell people, write letters to the editor and op-eds in local papers, put out information in Internet discussion groups and post it on your FB pages. Do talkbacks on the Internet and call in to radio shows. Send information (with the URL) to editors and demand that they cover this. Israel is being libeled daily. Help turn the tide. Working together you can. The news that has been released today is a mind-boggler. Two days ago, we lost three soldiers because an UNRWA clinic was booby-trapped, while some additional 17 soldiers were wounded. The soldiers were in the vicinity of the clinic because they were working on dismantling tunnels. “Over eighty kilograms of explosives were built into the UN-funded hospital’s walls themselves, it was cleared for publication Thursday – revealing that the clinic itself was built to mask, and perform, potential acts of terror on the IDF. Three times in this war alone (yes, it’s happened before), rockets have been discovered in an UNRWA facility and UNRWA staff don’t know how it got there. But eighty kilograms of explosives built into the walls of an UNRWA clinic? Tens of tunnels built under an UNRWA clinic? So far UNRWA has had no response, likely because there is nothing they can say without further implicating themselves. Please help make sure large numbers of people know about this (you will NOT find it in your mainstream media). There is a great deal more to say about Hamas and how it is functioning, all of which needs to be put out broadly. I will following with more in coming posts.